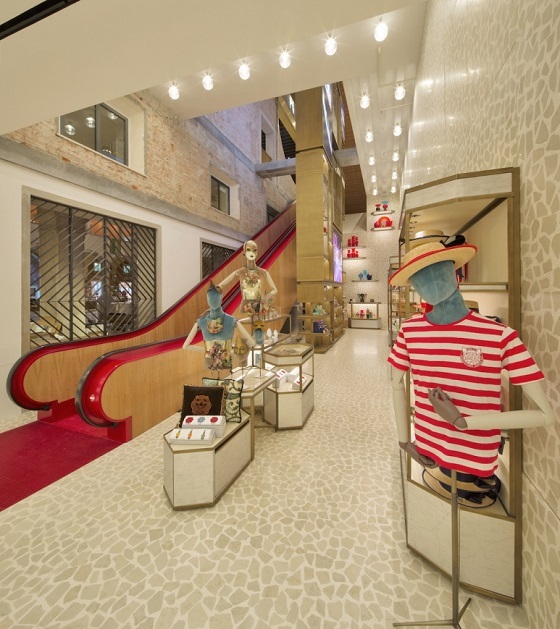 It is the first European retail space to be created by the LMVH-owned luxury brand, DFS. Why Venice? Well partly because they felt that “…there isn’t one place where you can go to find a succinct, well-curated shopping experience”. Radically restored in the 1930s and 1940s, when it was turned into Venice’s central post office, a cage of reinforced concrete was installed within it that is irreversible and which exacerbated the movement of the remaining parts of the structure. When the post office moved out, the only interested buyers of the building were hotel consortia, so it was acquired by the comune. but also for souvenirs. Yes! Since the Venice experience is so damaged by the sale everywhere of cheap imported souvenirs, DFS took the decision to provide really good souvenirs, that are made in Venice and Italy. But maybe the very best reason to go is for the platform on the roof from which there are most spectacular views over Venice – the Grand canal, the domes of St Mark’s. From here, Venice looks beautiful – you see the place, not the people. The original plan was to create a large terrace with two open sides but, disappointingly, that was vetoed. So, instead, there is a small wooden deck that so is popular you have to queue to get on it. But, whatever else you do, do queue! it is worth it (see my picture at the top of this post).